International Journal of Research in Health Sciences,2014,2,3,755-760. 1PG Scholar, R. A. Podar Medical College (AYU), 2MS, PhD, Guide, R. A. Podar Medical College (AYU), R. A. Podar Medical College(AYU), Worli, Mumbai -18, Maharashtra, INDIA. Background: Pulmonary Tuberculosis is a dreaded disease in the developing countries of the world. It is caused by a bacterial infection and it can lead to severe, debilitating disease. It's management includes a variety of Anti-TB Drugs which have various threatening side effects. 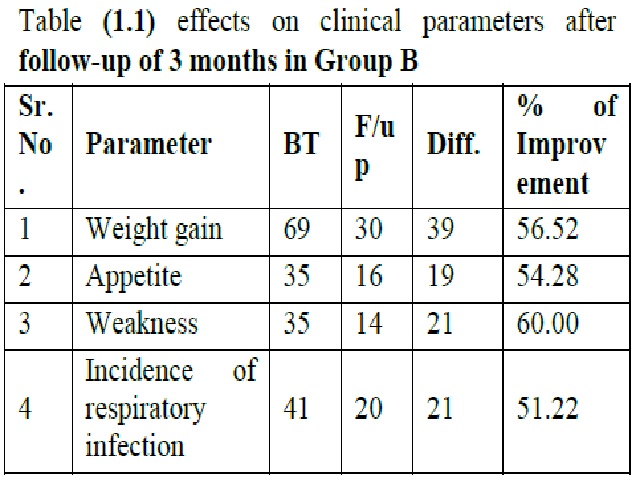 The use of Kharjuradi Ghrita and Pranayama can not only decrease the complications arising out of the management of TB but also improve the standard of living in a post TB treatment patient. Materials & Methods: This was a randomized control trial. Sixty patients were divided into two groups of thirty each. Group A (n=30), received Kharjuradi Ghrita, 20 ml rasayankale and Group B (n=30) received both Kharjuradi Ghrita and Prayanama once a day. Patients who had completed treatment for pulmonary tuberculosis were only selected and studied over a month. Parameters observed were weight gain, appetite, weakness and incidence of respiratory Infection. Results: Both groups showed significant improvement at the end of one month. (p < 0.05). However the group that received both Kharjuradi Ghrita and Pranayama showed better effects on appetite, strength and weight gain. The recovery was better and complications were minimal.